Calcium plays an important role in a wide variety of biological processes. This divalent metal ion can bind to a large number of proteins; by doing so it modifies their biological activity or their stability. Because of its distinct che- cal properties calcium is uniquely suited to act as an on-off switch or as a light dimmer of biological activities. 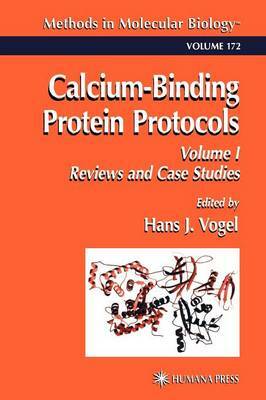 The two books entitled Calcium-Binding Protein Protocols (Volumes I and II) focus on modern experimental analyses and methodologies for the study of calcium-binding proteins. Both extracel- lar and intracellular calcium-binding proteins are discussed in detail. H- ever, proteins involved in calcium handling (e. g. , calcium pumps and calcium channels), fall outside of the scope of these two volumes. Also, calcium-bi- ing proteins involved in bone deposition will not be discussed, as this specific topic has been addressed previously. The focus of these two books is on studies of the calcium-binding proteins and their behavior in vitro and in vivo. The primary emphasis is on protein chemistry and biophysical methods. Many of the methods described will also be applicable to proteins that do not bind calcium. Calcium-Binding Protein Protocols is divided into three main sections. The section entitled Introduction and Reviews provides information on the role of calcium in intracellular secondary messenger activation mechanisms. Mo- over, unique aspects of calcium chemistry and the utilization of calcium in dairy proteins, as well as calcium-binding proteins involved in blood clotting, are addressed.